A truly chic luxurious four bedroom villa with breathtaking ocean views over the west coast of Koh Samui, the Five Islands and Ang Thong National Marine Park. This is the perfect holiday location for families or small groups of friends seeking a unique and private location away from the crowds, yet within beautiful stylish accommodation and natural surroundings. 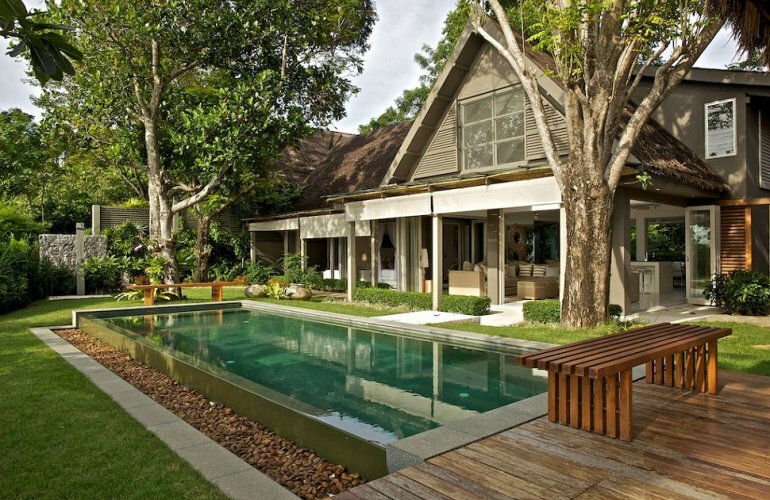 The residence is one of just a few in an exclusive community of luxury villas, just 45 minutes' drive from Samui International Airport, and also within easy reach of the main centres on the island, such as Lamai or Chaweng, for a taste of what there is to offer in a larger tourist town. But within walking distance along the beach are a few neighbouring resorts offering plenty of restaurants and spas, so there is definitely no need to use a car every day! The villa is tastefully furnished throughout, with Asian suggestions to the contemporary, minimalist feel and a full complement of modern appliances to make daily life easy and relaxed. The full height, fold out glass doors merge the indoor and outdoor experience, allowing guests to make full use of this sublime sea view location. Steps lead down from the villa to a quiet cove with a semi-private beach offering yet more breathtaking views to the nearby islands of the Ang Thong Marine Park. Throughout the villa there is free Wi-Fi Internet access, and an in-house music system which is both iPod and iPad compatible. The multi-level layout of the villa promotes practical and dedicated spaces for both adults and children, with bright, white interiors, comfortable furnishings and both in- and out-door dining spaces. The living areas and bedrooms have walls which fold open onto the tropical views, and the 10 x 3 meter infinity edge pool set in the garden in the front of the villa provides the ultimate cool-off retreat. The cool white living room and atrium dining area which can accommodate ten guests, open directly onto the spectacular surroundings and enjoy cooling sea breezes. The spacious sitting area features comfortable couches and armchairs, while the adjoining TV den is a favourite with the younger members of the family. The den is furnished with a long cushioned sofa in front of a large wall-mounted flat screen satellite TV/DVD/CD entertainment system. An open-plan western style kitchen equipped with a full range of modern appliances serves the dining space, while outside are the lawn and tropical garden, and the indulgent pool. There are two double and two twin comfortable and airy bedrooms, all of which are fully air conditioned, and all of which have generous en suite bathrooms with rain showers. One of the twin bedrooms also features a built-in upper bunk, perfect for children.